Bacterial Electrosynthesis is on the forefront of research activities devoted to discovery of new sustainable, environment-friendly, processes for the conversion of raw materials into products by biosynthesis. The bioelectrochemical system concept is simple, electrons (power) are transfered from the anode to the cathode (in the same way a battery does), and are provided as the main source of reducing equivalents in the cathode compartment. The reducing power is then used for the conversion of biomolecules by microorganisms that remain attached to the cathode. We are interested in autotrophic metabolisms, which require CO2 in addition to electrons and protons for the synthesis of chemicals and upgraded products. gEMM investigates the effect of operational conditions on the formation of biofilms over time and how different bacterial associations can be obtained leading to the formation of different products and services, from nitrate reduction to synthesis of acetate and butyrate. 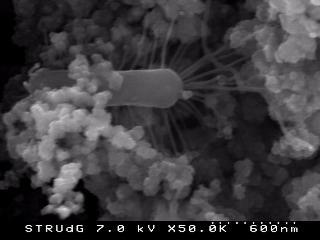 We apply sound molecular techniques to the discovery of Microbial community structures and to measure the cell activity and how it is shaped according to the usage or not of electrons.